Week 31: Where the Wild Things Are. Let the wild rumpus begin...or start, or whatever side of the literary debate you fall on discuss below. Either way, we really like this book (ok maybe I love this book and my daughter likes me reading it to her!). Honestly, we got home late last night and I was super tired, so this is what my tired brain came up with. The side dishes aren't that creative but they work and she enjoys the food so thats why I did them. Sometimes when you are making your kids' lunches you need to go with a little convenience and speed over anything else. 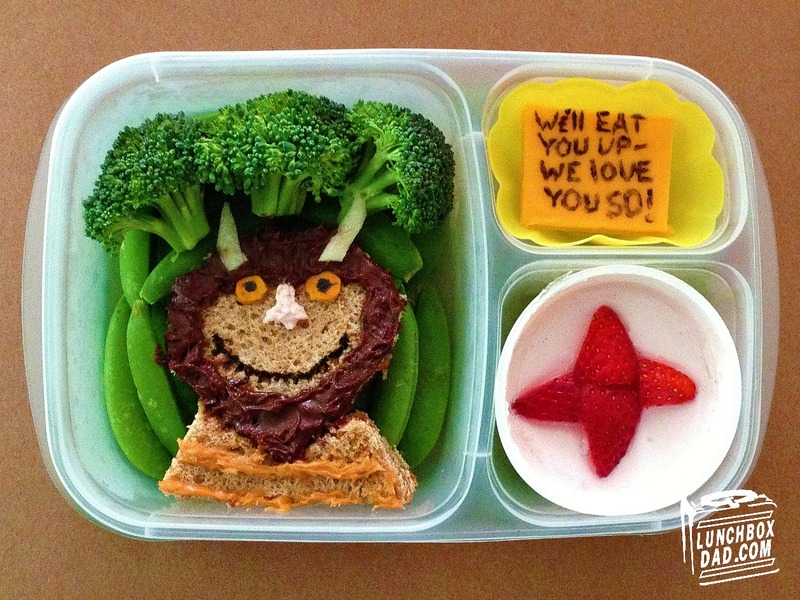 I packed this in my Easy Lunch Boxes container. --Cut wild thing head and shoulders (as shown in pic) out of a slice of whole wheat bread. Repeat with second piece of bread. Spread jelly (or substitute whatever your child prefers) on one slice and press together to make a sandwich. Use knife and toothpicks to spread Nutella around the head of the wild thing. Spread peanut butter in lines on the shoulders. --For the facial features, use a toothpick to spread the strawberry cream cheese for the nose. Cut out two circles of dried mango and place them on the face for his eyes. Cut two strips of dried green mango (they are actually white) and place them on his head for the horns. Use black food coloring (mix equal parts red, yellow, and blue) to draw the eyes and mouth. --Place wild thing in your container and surround with snap peas and broccoli to make the forest. --Cut a slice of cheese and draw the quote in the picture with black food coloring. On the yogurt, put pieces of strawberry on top to form the star. 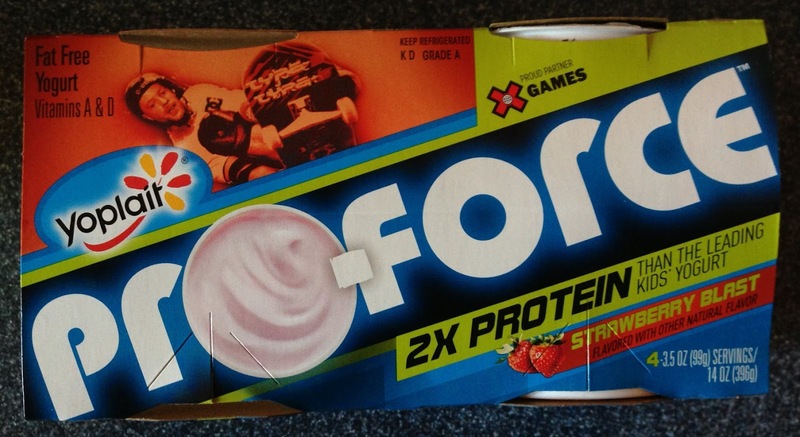 For this lunch I am trying Yoplait ProForce which has an extra amount of protein. Here is the picture of the package. I hope you enjoyed the Star Wars blog hop this weekend. If you didn't see it click HERE for my Chewbacca lunch and keep clicking the big button to see the others. Have a great week, leave your comments below, and be sure to follow me on Facebook, Twitter, and Pinterest! this is great! You did a fantastic job on the sandwich, and I love the jungle behind him! Thanks, unfortunately my daughter dropped the sandwich, but fortunately the veggie jungle was saved, so she had to eat her vegetables at school!